Buzz: Main Line Restaurant Week Launch Party at Ralph’s KOP! The Rubino family, of Ralph’s, is our prestigious host for the incredible evening of Sept 19th and we are truly honored! To say we have outdone ourselves this season for the official kickoff party to Fall Main Line Restaurant Week would be QUITE the understatement! Join the Main Line’s most beautiful people, top networkers and local enthusiastic foodies for the fabulous official kickoff party of Fall Main Line Restaurant Week at Ralph’s of South Philly in King of Prussia on Thursday, September 19th from 6pm to 9pm. 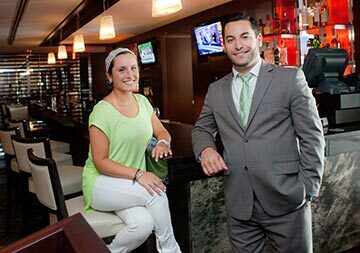 Ralph’s, going on their first year in business inside the beautiful (and brand new) Sheraton Valley Forge Hotel in King of Prussia, will be wowing attendees with their famous Italian cuisine—not to be missed! The new restaurant concept is a contemporary version of the original, nationally renowned Ralph’s located in the heart of South Philly. There is no cover charge/cost to attend the party, complimentary food will be available throughout the evening and delicious cocktails will be served via a cash bar. The party will be held in Ralph’s gorgeous bar and adjacent lounge area. In addition, attendees can enjoy an endless buffet of complimentary food in one of Ralph’s dining rooms. Attire is business casual to sophisticated cocktail. DRESS TO IMPRESS so you can tag your gorgeous self the next day on Facebook! Walk-ins are welcome. RSVPs on Facebook are very helpful to us to plan accordingly. You can also email us your name and party size to: rsvp@aroundmainline.com. EVENT GUIDELINES: This party is strictly 21 and over. No cameras and video cameras are permitted in the party. Only pre-approved press will be permitted to take photos or video. Large bags are not permitted in the party. Attendees cannot enter event possessing flyers, folders, business binders, business directories or any large pieces of marketing materials. We expect a very large turnout so our best advice is to arrive no later than 6:30pm. Mark your calendars for the most incredible kickoff to Main Line Restaurant Week! Questions about the party? Email: slockard@aroundmainline.com. Address: 480 North Gulph Road in King of Prussia, Pennsylvania.